Deep down below us is a tug of war moving at less than the speed of growing fingernails. Keeping your balance is not a concern, but how the movement happens has been debated among geologists. New findings from under the Pacific Northwest Coast by University of Oregon and University of Washington scientists now suggest a solution to a mystery that surfaced when the theory of plate tectonics arose: Do the plates move the mantle, or does the mantle move the plates. The separation of tectonic plates, the researchers proposed in a paper online ahead of print in the journal Nature Geoscience, is not simply dictating the flow of the gooey, lubricating molten material of the mantle. The mantle, they argue, is actually fighting back, flowing in a manner that drives a reorientation of the direction of the plates. The research—funded through National Science Foundation grants to the two institutions – also explored how the supply of magma varies under mid-ocean ridge volcanoes. The researchers conducted a seismic experiment to see how seismic waves moved through the shallow mantle below the Endeavor segment. Astronomers have used data from NASA’s Chandra X-ray Observatory to make a discovery that may have profound implications for understanding how the magnetic field in the Sun and stars like it are generated. Researchers have discovered that four old red dwarf stars with masses less than half that of the Sun are emitting X-rays at a much lower rate than expected. X-ray emission is an excellent indicator of a star’s magnetic field strength so this discovery suggests that these stars have much weaker magnetic fields than previously thought. Since young stars of all masses have very high levels of X-ray emission and magnetic field strength, this suggests that the magnetic fields of these stars weakened over time. While this is a commonly observed property of stars like our Sun, it was not expected to occur for low-mass stars, as their internal structure is very different. The Sun and stars like it are giant spheres of superheated gas. The Sun’s magnetic field is responsible for producing sunspots, its 11-year cycle, and powerful eruptions of particles from the solar surface. These solar storms can produce spectacular auroras on Earth, damage electrical power systems, knock out communications satellites, and affect astronauts in space. The rotation of a star and the flow of gas in its interior both play a role in producing its magnetic field. The rotation of the Sun and similar stars varies with latitude (the poles versus the equator) as well as in depth below the surface. Another factor in the generation of magnetic field is convection. Similar to the circulation of warm air inside an oven, the process of convection in a star distributes heat from the interior of the star to its surface in a circulating pattern of rising cells of hot gas and descending cooler gas. Convection occurs in the outer third (by radius) of the Sun, while the hot gas closer to the core remains relatively still. There is a difference in the speed of rotation between these two regions. Many astronomers think this difference is responsible for generating most of the magnetic field in the Sun by causing magnetic fields along the border between the convection zone and the core to wind up and strengthen. Since stars rotate more slowly as they age, this also plays a role in how the magnetic field of such stars weakens with time. For stars much less massive than the Sun, convection occurs all the way into the core of the star. This means the boundary between regions with and without convection, thought to be crucial for generating magnetic field in the Sun, does not exist. 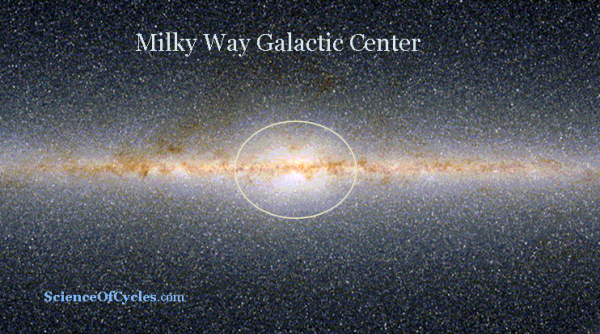 One school of thought has been that magnetic field is generated mostly by convection in such stars. 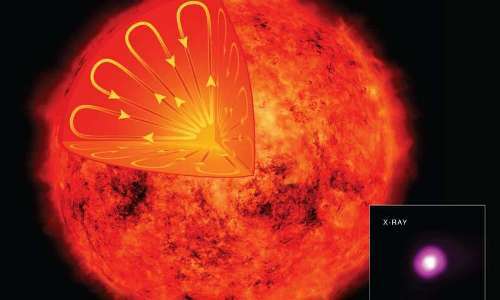 Since convection does not change as a star ages, their magnetic fields would not weaken much over time. By studying four of these low-mass red dwarf stars in X-rays, Wright and Drake were able to test this hypothesis. They used NASA’s Chandra X-ray Observatory to study two of the stars and data from the ROSAT satellite to look at two others. These results imply that the interaction along the convection zone-core boundary does not dominate the generation of magnetic field in stars like our Sun, since the low mass stars studied by Wright and Drake lack such a region and yet their magnetic properties are very similar. A paper describing these results by Wright and Drake appears in the July 28th issue of the journal Nature. NASA’s Marshall Space Flight Center in Huntsville, Alabama, manages the Chandra program for NASA’s Science Mission Directorate in Washington. 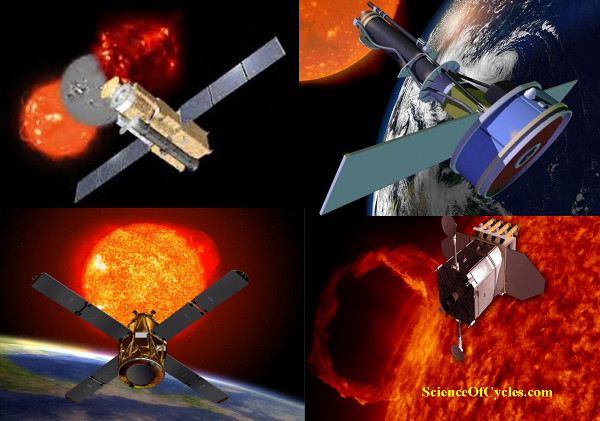 The Smithsonian Astrophysical Observatory in Cambridge, Massachusetts, controls Chandra’s science and flight operations. A new study carried out on the floor of Pacific Ocean provides the most detailed view yet of how the Earth’s mantle flows beneath the ocean’s tectonic plates. The findings, published in the journal Nature, appear to upend a common belief that the strongest deformation in the mantle is controlled by large-scale convection movement of the plates. Instead, the highest resolution imaging yet reveals smaller-scale processes at work that have more powerful effects. By developing a better picture of the underlying engine of plate tectonics, scientists hope to gain a better understanding of the mechanisms that drive plate movement and influence related process, including those involving Earthquakes and volcanoes. When we look out at the Earth, we see its rigid crust, a relatively thin layer of rock that makes up the continents and the ocean floor. The crust sits on tectonic plates that move slowly over time in a layer called the lithosphere. At the bottom of the plates, some 80 to 100 kilometers below the surface, the asthenosphere begins. Earth’s interior flows more easily in the asthenosphere, and convection here is believed to help drive plate tectonics, but how exactly that happens and what the boundary between the lithosphere and asthenosphere looks like isn’t clear. One process missing from this study, is what causes the ebb and flow of convection? This is to say, what is the mechanism which causes the Earth’s core to heat up, or in cycles when it cools down? This is fundamental process of the dynamo theory which is “convection. 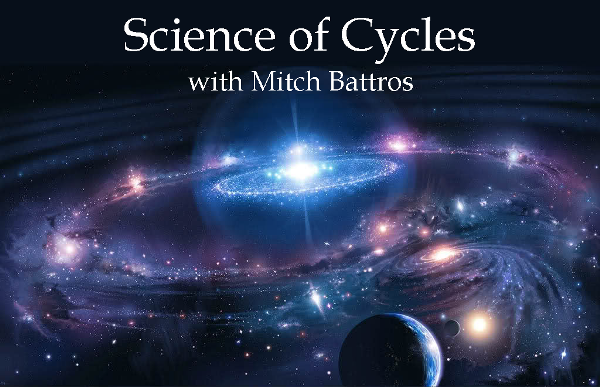 My research suggests it is the cyclical expansion and contraction of celestial charged particles. To take a closer look at these processes, a team led by scientists from Columbia University’s Lamont-Doherty Earth Observatory installed an array of seismometers on the floor of the Pacific Ocean, near the center of the Pacific Plate. By recording seismic waves generated by Earthquakes, they were able to look deep inside the Earth and create images of the mantle plumes, similar to the way a doctor images a broken bone. Seismic waves move faster through flowing rock because the pressure deforms the crystals of olivine, a mineral common in the mantle, and stretches them in the same direction. By looking for faster seismic wave movement, scientists can map where the mantle plume is flowing today and where it has flowed in the past. Three basic forces are believed to drive oceanic plate movement: plates are “pushed” away from mid-ocean ridges as new sea floor forms; plates are “pulled” as the oldest parts of the plate dive back into the Earth at subduction zones; and convection within the asthenosphere helps ferry the plates along. If the dominant flow in the asthenosphere resulted solely from “ridge push” or “plate pull,” then the crystals just below the plate should align with the plate’s movement. 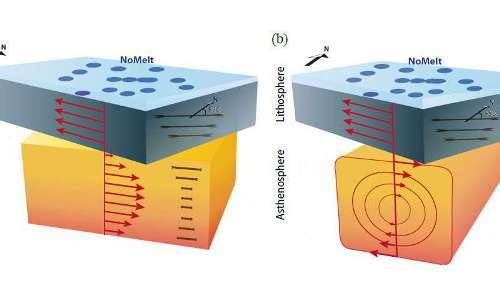 The study finds, however, that the direction of the crystals doesn’t correlate with the apparent plate motion at any depth in the asthenosphere. Instead, the alignment of the crystals is strongest near the top of the lithosphere where new sea floor forms, weakest near the base of the plate, and then peaks in strength again about 250 kilometers below the surface, deep in the asthenosphere. “If the main flow were the mantle being sheared by the plate above it, where the plate is just dragging everything with it, we would predict a fast direction that’s different than what we see,” said coauthor James Gaherty, a geophysicist at Lamont-Doherty. “Our data suggest that there are two other processes in the mantle that are stronger: one, the asthenosphere is clearly flowing on its own, but it’s deeper and smaller scale; and, two, seafloor spreading at the ridge produces a very strong lithospheric fabric that cannot be ignored.” Shearing probably does happen at the plate boundary, Gaherty said, but it is substantially weaker. Looking at the entire upper mantle, the scientists found that the most powerful process causing mantle plumes to flow happens in the upper part of the lithosphere as new sea floor is created at a mid-ocean ridge. As molten rock rises, only a fraction of the flowing rock squeezes up to the ridge. On either side, the pressure bends the excess rock 90 degrees so it pushes into the lithosphere parallel to the bottom of the crust. The flow solidifies as it cools, creating a record of sea floor spreading over millions of years. 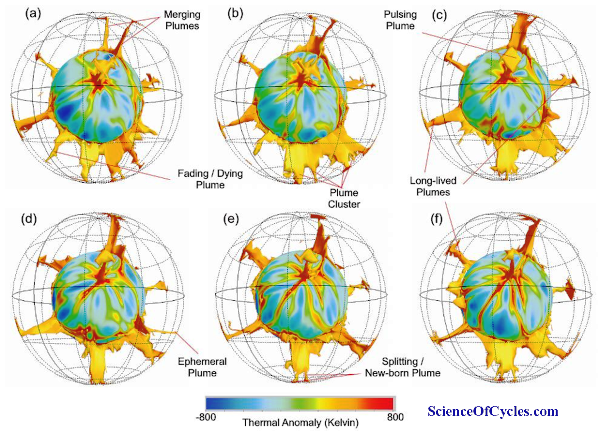 In the asthenosphere, the patterns suggest two potential flow scenarios, both providing evidence of convection channels that bottom out about 250 to 300 kilometers below the Earth’s surface. In one scenario, differences in pressure drive the flow like squeezing toothpaste from a tube, causing rocks to flow east-to-west or west-to-east within the channel. The pressure difference could be caused by hot, partially molten plumes beneath mid-ocean ridges or beneath the cooling plates diving into the Earth at subduction zones, the authors write. Another possible scenario is that small-scale convection is taking place within the channel as chunks of mantle cool and sink. High-resolution gravity measurements show changes over relatively small distances that could reflect small-scale convection. A new study carried out on the floor of Pacific Ocean provides the most detailed view yet of how the Earth’s mantle flows beneath the ocean’s tectonic plates. The findings, published in the journal Nature, appear to upend a common belief that the strongest deformation in the mantle is controlled by large-scale movement of the plate tectonics. Instead, the highest resolution imaging yet reveals smaller-scale processes at work that have more powerful effects. To take a closer look at these processes, a team led by scientists from Columbia University’s Lamont-Doherty Earth Observatory installed an array of seismometers on the floor of the Pacific Ocean, near the center of the Pacific Plate. By recording seismic waves generated by earthquakes, they were able to look deep inside the earth and create images of the mantle’s flow, similar to the way a doctor images a broken bone. Seismic waves move faster through flowing rock because the pressure deforms the crystals of olivine, a mineral common in the mantle, and stretches them in the same direction. By looking for faster seismic wave movement, scientists can map where the mantle is flowing today and where it has flowed in the past. 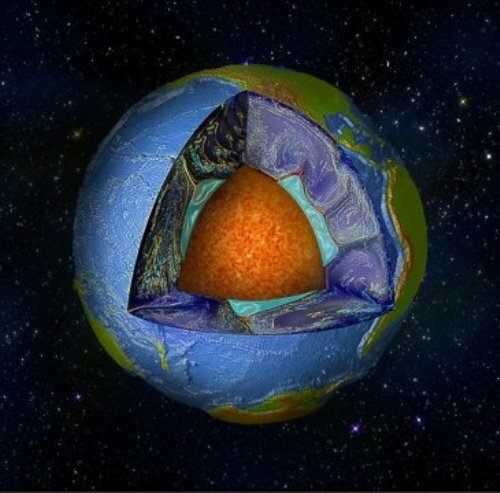 Looking at the entire upper mantle, the scientists found that the most powerful process causing rocks to flow happens in the upper part of the lithosphere as new sea floor is created at a mid-ocean ridge. As molten rock rises, only a fraction of the flowing rock squeezes up to the ridge. On either side, the pressure bends the excess rock 90 degrees so it pushes into the lithosphere parallel to the bottom of the crust. The flow solidifies as it cools, creating a record of sea floor spreading over millions of years. This “corner flow” process was known, but the study brings it into greater focus, showing that it deforms the rock crystals to a depth of at least 50 kilometers into the lithosphere. 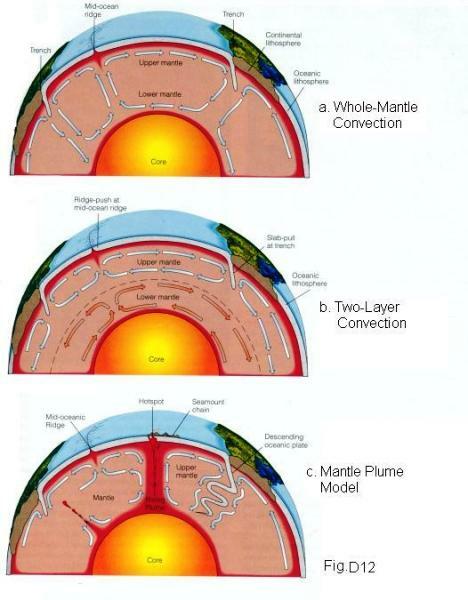 In the asthenosphere, the patterns suggest two potential flow scenarios, both providing evidence of convection channels that bottom out about 250 to 300 kilometers below the earth’s surface. In one scenario, differences in pressure drive the flow like squeezing toothpaste from a tube, causing rocks to flow east-to-west or west-to-east within the channel. The pressure difference could be caused by hot, partially molten rock piled up beneath mid-ocean ridges or beneath the cooling plates diving into the earth at subduction zones, the authors write. Another possible scenario is that small-scale convection is taking place within the channel as chunks of mantle cool and sink. High-resolution gravity measurements show changes over relatively small distances that could reflect small-scale convection. “The fact that we observe smaller-scale processes that dominate upper-mantle deformation, that’s a big step forward. But it still leaves uncertain what those flow processes are. 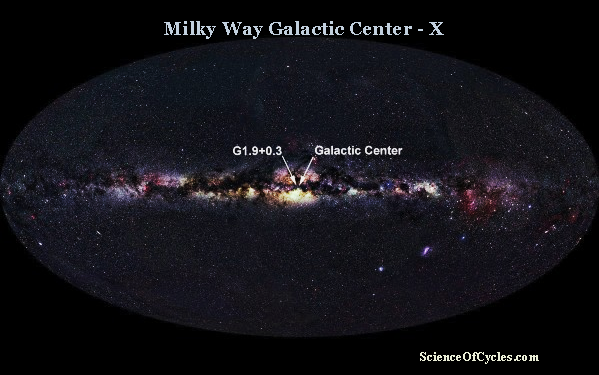 We need a wider set of observations from other regions,” Gaherty said. The study is part of the NoMelt project, which was designed to explore the lithosphere-asthenosphere boundary at the center of an oceanic plate, far from the influence of melting at the ridge. The scientists believe the findings here are representative of the Pacific Basin and likely ocean basins around the world. NoMelt is unique because of its location. Most studies use land-based seismometers at edge of the ocean that tend to highlight the motion of the plates over the asthenosphere because of its large scale and miss the smaller-scale processes. NoMelt’s ocean bottom seismometer array, with the assistance of Lamont’s seismic research ship the Marcus G. Langseth, recorded data from earthquakes and other seismic sources from the middle of the plate over the span of a year. 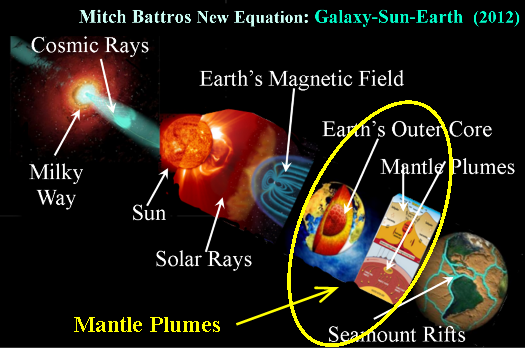 Ongoing studies supported by the NSF (National Science Foundation) indicate a connection between submarine troughs (rifts), Earth’s mantle, and Earth’s outer core. Furthermore, new research indicates the shifting of magnetic flux via Earth’s magnetic field, has a direct and symbiotic relationship to Earth’s outer core, mantle, lithosphere, and crust. As a living entity, Earth fights for its survival. If internal or external events begin to throw Earth out of balance i.e. orbital, tilt, or magnetic alignment – it begins to correct itself. When oceanic tectonic subductions occur, it cools the mantle and outer core. To balance this shift in temperatures, the Earth’s core increases heat and as a result releases what is known as “mantle plumes”. These plumes filled with super-heated liquid rock float up to the ocean bottom surface. This action both cools the outer core and heats the oceans. As a result of heated oceans, we get tropical storms and various forms of extreme weather. When troughs, subduction zones, and rifts shift, as a result of convection, earthquakes, tsunamis, and volcanoes occur. What makes this all work is the Earth’s magnetic field. Right now the magnetic field is weakening significantly. This will continue until it reaches zero point, at which time there will be a full magnetic reversal. Until this time, we will witness magnetic north bouncing in the northern hemisphere. Closer to the moments of a full reversal, we will see magnetic north drop down to/then below the equator. 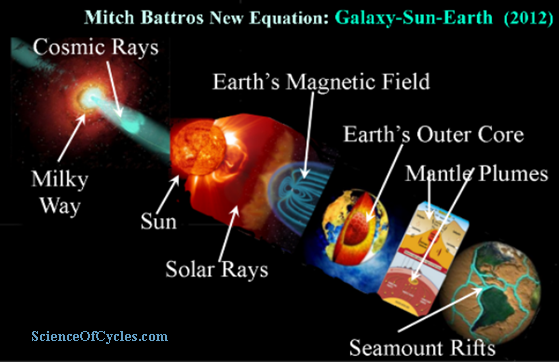 As a result of a weakened magnetic field, larger amounts of radiation via charged particles such as solar flares, coronal mass ejections, gamma rays, and galactic cosmic rays – are more abundantly reaching Earth’s atmosphere and having a heightened reaction with Earth’s core layers. This is what causes looped reaction. 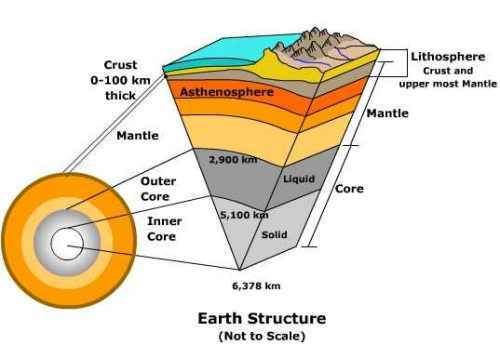 Radiation heats the core layers, the outer core reacts by producing ‘mantle plumes’, which causes crustal fracturing, which then causes earthquakes, volcanoes, heated oceans – all of which cools the outer core. 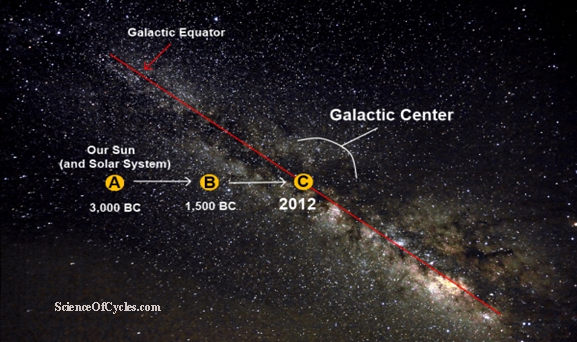 This seemingly repeating loop will continue until the Earth will once again find its balance. 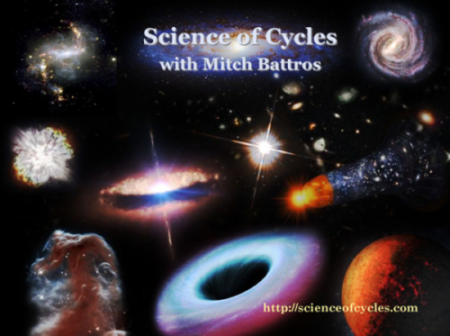 Until then, we can expect naturally occurring earth changing events which will produce the loss of mass in some parts of the world, and emergence of mass in other parts. Maybe this is the time to change the things we can (attitude, environment, community, self, surroundings), one would be a fool not to apply themselves within their means – but then there is the time to loosen up a bit, know what is happening is just part of a process. Just as the Earth, we humans can just keep on trucking, and maybe, just maybe, some will simply ‘enjoy-the-ride’.